A quick update from our Operations Manager Scott Kerr. Well what an opening month it has been! Nearly 30 clients have taken delivery of their brand new Keyz rideshare rental car and are now earning great money driving for Uber X, Uber XL and Uber Select. We started this company on the basis that we wanted to help our clients have the ability to work flexible hours to match their lifestyle by driving for companies like Uber. 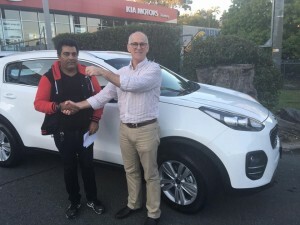 We also wanted to provide our clients with a new car to help with their driver rating and also offer the flexibility of options on our cars as we know everyone has different needs and expectations. The feedback we have received to date from our driver partners has been overwhelmingly positive. They all love the flexibility that both Uber offer as employer and Keyz offer as a flexible rideshare rental supplier. We have had some individual requests for particular colours, models, specifications in our range of cars that we offer and we were only too happy to accommodate them. Here at Keyz we are looking to continue helping more new driver partners into brand new vehicles so they can start earning! We hope to hear from you soon.